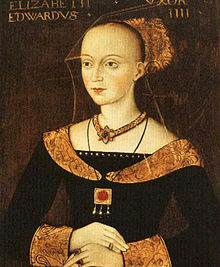 I love this period of Plantagenet history and always found it fascinating that Elizabeth Woodville (aka the White Queen) was called “the most beautiful woman in the Island of Britain” with “heavy-lidded eyes like those of a dragon”,’suggesting a perhaps unusual criterion by which beauty in late medieval England was judged’. The book shows her rise to power (which seems to happen in an instant in the book) from being the widow of not royal Lord John Grey to captivating a fairly young at 22 King Edward IV, she is 5 years older. The book portrays the love affair between Elizabeth and Edward (he was not a specially faithful man) and her family’s rise to power . It touches on the rumour of Richard 111 wanting to marry her daughter. Not Hilary Mantel as characters are a bit one dimensional but an enjoyable read — Next book is about Margaret Beaufort, mother to Henry Tudor!! The Sunne in Splendour by Sharon Penman covers same story. This entry was posted in Book Reviews, Books, TV tie in and tagged Book Reviews, Reviews. Bookmark the permalink.